At the invitation of the Brazilian government, Vice Chairman of the NPC Standing Committee Ji Bingxuan, as President Xi Jinping's Special Envoy, will travel to Brasília to attend the inauguration ceremony of President Jair Bolsonaro on January 1, 2019. Q: According to reports, Russia's Ambassador to China Andrei Denisov said on December 26 that Russian President Vladimir Putin will become a key guest and participant of the second Belt and Road Forum for International Cooperation to be held in April next year. President Xi Jinping will visit Russia next year. The 24th regular meeting between the Chinese Premier and Russian Prime Minister might be held earlier next year in Russia. Russia will also hold celebratory activities for the 70th anniversary of the establishment of diplomatic relations between Russia and China next year. Can you confirm that and provide us more details? A: On December 21, Assistant Foreign Minister Zhang Hanhui held consultations with Russian Deputy Foreign Minister Morgulov in Beijing to have an in-depth exchange of views on high-level exchanges between the two countries next year. The two sides agreed that under the strategic leadership of the two heads of state, this year's China-Russia comprehensive strategic partnership of coordination has achieved great development while operating at a high level, and cooperation in various fields has yielded fruitful outcomes. As China and Russia mark the 70th anniversary of the establishment of diplomatic relations next year, the two sides will continue to work together to make good preparations for a series of important high-level exchanges centered around the exchanges between the two heads of state. We all know that China and Russia have a tradition of supporting each other in hosting major international events and making mutual visits by the heads of state every year. In their bilateral meeting at the G20 Buenos Aires Summit not long ago, President Xi Jinping and President Putin have extended invitations to each other and agreed to attend each other's major international events in the first half of next year. The two presidents also agreed to hold grand celebrations for the 70th anniversary of the establishment of diplomatic relations. 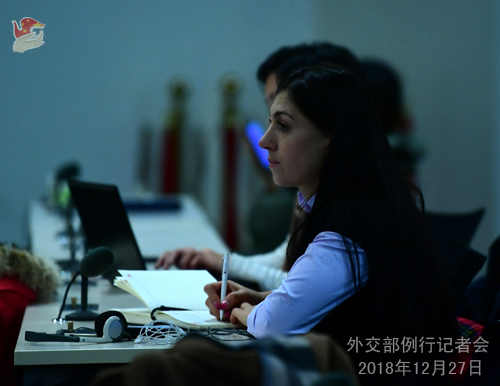 China and Russia will also organize various events among different departments at the national and sub-national levels for the 70th anniversary to consolidate the time-honored friendship between the two peoples, promote bilateral relations to achieve more outcomes in the coming year and join hands to make greater contributions to safeguarding international fairness and justice and world peace and stability. Q: Sources said that the Trump administration is considering an executive order that would probably come in January, 2019 to declare a national security emergency that bars US companies from using telecommunications equipment made by Huawei and ZTE. Does China have any response to it? A: What you mentioned has not been confirmed. I do not want to officially comment on the news that has not been confirmed. However, recently, there have been indeed a lot of discussions in this regard. 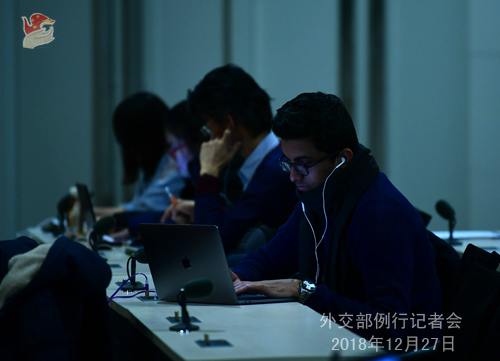 Officials, scholars and media from many countries, including many people in the US as well as the US media, sharply pointed out the essence and nature of the problems facing the development of Chinese high-tech companies overseas. We'd better let facts speak for themselves when it comes to the issue of security. Despite not having any evidence, certain countries have politicized the normal exchanges and cooperation in science and technology and even obstructed and restricted the normal operations of Chinese businesses on unwarranted charges and under the pretext of national security. This actually amounts to shutting their own door to openness, progress and fairness. Q: You just announced that Special Envoy Ji Bingxuan will travel to Brazil for the inauguration ceremony of the new President. Could you offer us more details? A: China and Brazil are both major developing countries and important emerging markets. In recent years, China-Brazil relations have been growing rapidly in an all-round manner as evidenced by fruitful outcomes in practical cooperation across the board. Developing China-Brazil ties has become the widespread consensus of people in all sectors in our two countries. After his election, the incoming Brazilian President Bolsonaro said that Brazil views China as a great cooperative partner and will actively develop its cooperation with China. China always attaches importance to developing its relations with Brazil from a strategic and long-term perspective. We stand ready to join hands with Brazil to maintain and ensure the sound growth of our comprehensive strategic partnership in an effort to deliver more benefits to the two peoples and make due contributions to upholding the common interests of developing countries and safeguarding peace and stability of the region and beyond. Q: It is reported that a cruise ship with 21 Chinese citizens on board capsized in the waters near Nha Trang City, Khanh Hoa province, Vietnam on December 26. Can you provide further details? A: On the afternoon of December 26, a cruise ship with 21 Chinese tourists on board capsized in waters near Nha Trang, Vietnam. Nineteen of them have been rescued, one was killed, and one is in critical condition. The Chinese Consulate-General in Ho Chi Minh City activated the emergency response mechanism immediately, dispatching staff to the scene and urging the Vietnamese side to make their best efforts at rescue. The Chinese Consulate-General will continue to coordinate with the Vietnamese side to ensure proper treatment for the injured and settlement for the rescued and provide the necessary assistance for the involved Chinese tourists and their families. The New Year's Day holiday is approaching, and we want to take this opportunity to remind the Chinese citizens who are planning to travel overseas to raise their risk awareness, carefully arrange the itinerary, and always take safety as the top priority. 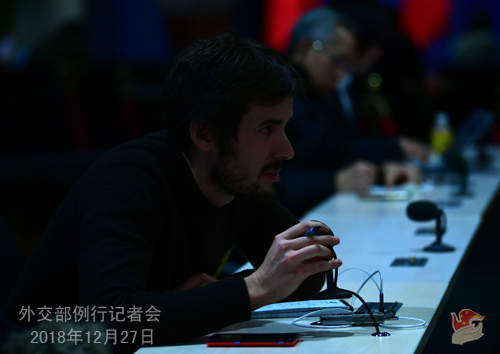 Q: The Chinese media reported that a Canadian citizen would be tried and an appeal would be heard on Saturday on drug-smuggling charges and the individual's name as reported is Robert Lloyd Schellenberg. Can you confirm it and are you in contact with the Canadian side over this case? A: I am not aware of the specifics of this case and I would refer you to the competent authority. If foreign citizens are involved, I believe that the relevant Chinese authority will conduct consular notification in a timely manner. Q: The Chinese-funded drug abuse treatment and rehabilitation center in Sarangani was recently inaugurated after its construction was completed ahead of schedule and handed over to the Philippines last week. The Sarangani Governor lauded the project and said that this would be one that will really reform the patients. What is China's comment on this? Can you further introduce China's efforts to help the Philippines to cope with the drug problem? A: As the Sarangani Governor said, after its completion, the drug abuse treatment and rehabilitation center in Sarangani will help local people who have suffered drug abuse embrace normal life again. As far as I know, another Chinese-funded drug rehabilitation center in Agusan del Sur in the region of Mindanao is also under construction. At present, China-Philippines relations continue to develop steadily. The Chinese side attaches importance to the development of China-Philippines relations and supports the Philippine government in carrying out anti-drug, anti-terrorism and other just causes under the leadership of President Duterte. In addition to aiding the construction of drug rehabilitation centers, China also conducts extensive cooperation with the Philippines on anti-drug training, intelligence sharing and joint investigations. China is willing to continue to assist the Philippines in solving the drug problem and improving the people's livelihood as its capacity allows. 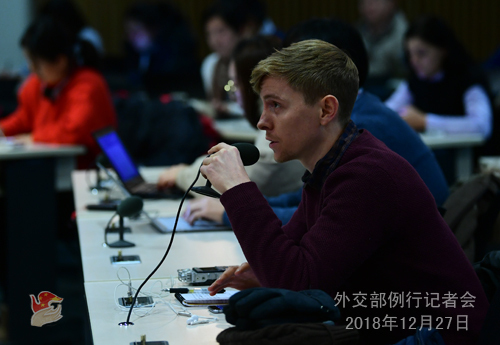 Q: Can you confirm the report that the relevant US government delegation is travelling to China in early January next year? If so, can you share more details about this meeting? A: With regard to the specifics of the China-US trade talks, I would refer you to the Commerce Ministry. According to my information, the economic teams of the two sides maintain close communication on the arrangement of the trade negotiations. Q: Could you just confirm that the foreigner who will be tried is Canadian? Would the current diplomatic tensions between China and Canada have any impact on the outcome of this case? A: Like I said just now, I am not aware of the specifics of the case. As to the diplomatic tensions between China and Canada, I think you are very clear about the reason for that. I have made clear China's solemn position on it many times before. Q: The tsunami casualties in Indonesia this time have been huge, highlighting the growing importance of disaster management cooperation between regional countries. What cooperation has China and ASEAN countries carried out in this regard? A: Indeed, the major casualties caused by the Indonesian tsunami further illustrated the necessity and urgency of strengthening disaster management cooperation among regional countries. China and ASEAN countries are actively engaged in disaster management cooperation and are negotiating to sign the Memorandum of Understanding on Disaster Management Cooperation. China conducts annual dialogues and exchanges with the ASEAN Coordinating Centre for Humanitarian Assistance on Disaster Management (AHA Center) and engages with six ASEAN countries including Indonesia to discuss the earthquake and tsunami monitoring and early warning system. Under the framework of the ASEAN Regional Forum (ARF), China and ASEAN countries have jointly held seminars on the Asia-Pacific ocean disaster management, earthquake disaster response and urban search and rescue capacity building, and regional climate change and coastal disaster relief, made the initiative to issue the Statement on Strengthening Disaster Management Cooperation, and explored the establishment of regional early warning mechanisms. Taking the East Asia Cooperation as a platform, China is willing to carry out disaster management cooperation and share disaster relief experience, ideas and technologies with regional countries to further enhance regional disaster prevention and mitigation capabilities. Q: Reports say that two Chinese fishing ships barged into Japan's Exclusive Economic Zone for fishing last month. After that, the Japanese fisheries agency officials boarded the ships to carry out inspection. The Japanese government has protested to the Chinese government on this. What is your comment? A: As to the report you mentioned, I have checked the relevant situation with the Chinese competent authority. According to the Chinese competent authority, it has been 50 days since this incident happened. China and Japan have exchanges views on it. The Chinese ships did not engage in "trans-boundary fishing" as the Japanese side claimed. We are dissatisfied with the co-called "boarding the ships to carry out inspection" on the part of the Japanese fisheries agency. 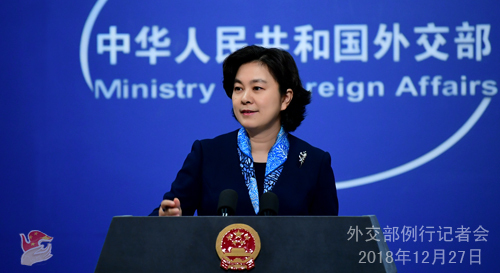 We urge the Japanese side to observe the China-Japan Fisheries Agreement, earnestly respect the legitimate rights and interests of Chinese fishermen and refrain from obstructing the normal operation of Chinese fishing ships. Q: This upcoming January 1 marks the 40th anniversary of the establishment of diplomatic relations between China and the US. How do you describe the China-US ties in the past forty years? A: This year marks the 40th anniversary of the joint communiqué on establishing China-US diplomatic relations. Over the past four decades, China-US ties have achieved far more growth than erstwhile predictions. Ancient Chinese philosopher Confucius observed that "when reaching the age of forty, one should have no more doubts." If the past four momentous decades of China-US engagement were any guide, it boils down to the conclusion that our two countries stand to gain from cooperation and lose from confrontation. Although China-US relations are about to reach the age of forty, we can see that some people in the US still have doubts and perplexities. Today, we believe that people of vision from both sides must see through the mist and reconfirm this valuable consensus: cooperation benefits both sides, while confrontation makes no one a winner. The two sides should expel various disturbances and show the wisdom of "having no more doubts". In their recent meeting on the sidelines of the G20 Summit, President Xi Jinping and President Donald Trump had an in-depth strategic discussion. They agreed to pursue a China-US relationship defined by coordination, cooperation and stability, and charted the way for addressing the existing issues between the two countries and promoting the healthy growth of China-US relations. 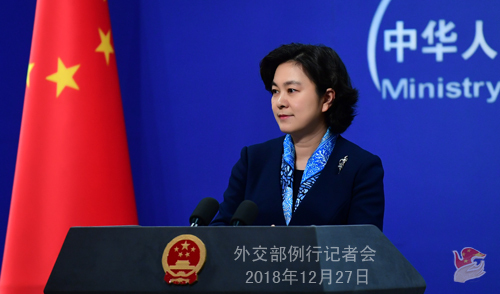 We hope that the US side could meet us halfway and follow the spirit of mutual respect and win-win cooperation to continuously promote the sound and steady development of China-US relations in the right direction as this serves the fundamental interests of the two peoples and meets the shared aspirations of people from all over the world.